I remember reviewing Vallendusk's self-titled EP last year and I loved it. Ever since then I've been eagerly awaiting the day when they would release some more stuff. At last, that day has come. Their full-length debut, Black Clouds Gathering, has just been released by that fantastic purveyor of obscure oriental delights, Pest Productions. The members of Vallendusk have either saved up a lot of money or they have friends in high places, because the production on this album is superb. The sound is clear and warm and all the instruments shine through with ease. Whereas most other atmospheric black metal bands stick to mid-paced rhythms, the drums here like to play fast and hard, with constant blast beats and double bass crashing down upon you like torrential rain. However, there are those times when they play simpler post-rock beats to keep things from getting repetitive. The vocals consist of a rasp that reminds me of Skagos, Oskoreien, and other similar bands. Pretty standard but still well-performed. As with most other Indonesian acts, the best part is the guitar work. 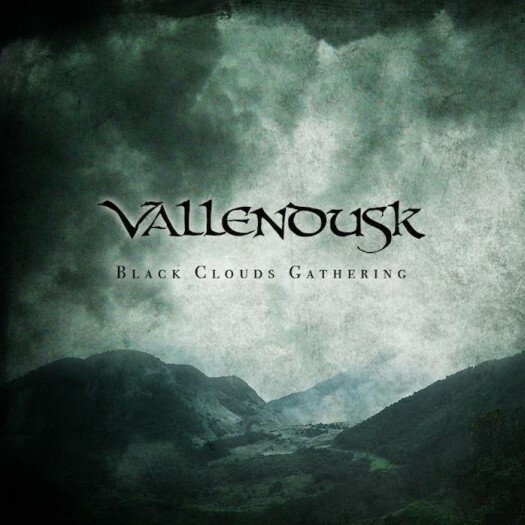 Unlike most other black metal bands, the tone Vallendusk uses is warm and resonating, a trait which can best be heard on songs like “To Wander and Beyond” and “Into the Mist”. The rapid tremolo riffs they play exhibit melodies that help to create an environment that is grand and epic in its scale. This wondrous and expansive feel can best be seen on songs like “Among the Giants” and the thirteen minute long epic “Land of the Lurking Twilight”. Some of these melodic riffs can be downright catchy, as can be heard on “Realms of the Elder”. They throw in lots of different influences ranging from post-rock to Norwegian black metal to create a guitar sound that is fresh and unique while still familiar and pleasing to the ears. Not only that, but they also play plenty of acoustic guitars to add a bit of variety and break up the pace. Vallendusk easily exceeded my expectations. They created something that boasts amazing and powerful production, superb and relentless drums, and wondrous guitar work. This album proves that the Indonesian metal scene is getting larger and more vibrant with every passing day. Not only can the Indonesians produce great death metal, they can also produce great black metal. This is a hell of a great find. Only on song two and I am loving this. Yeah it's good. Of the two albums (Vallendusk & Theoria) I actually like Theoria more. But both are great examples of atmospheric black metal. Theoria did little for me. Vallendusk is on my buy list though.